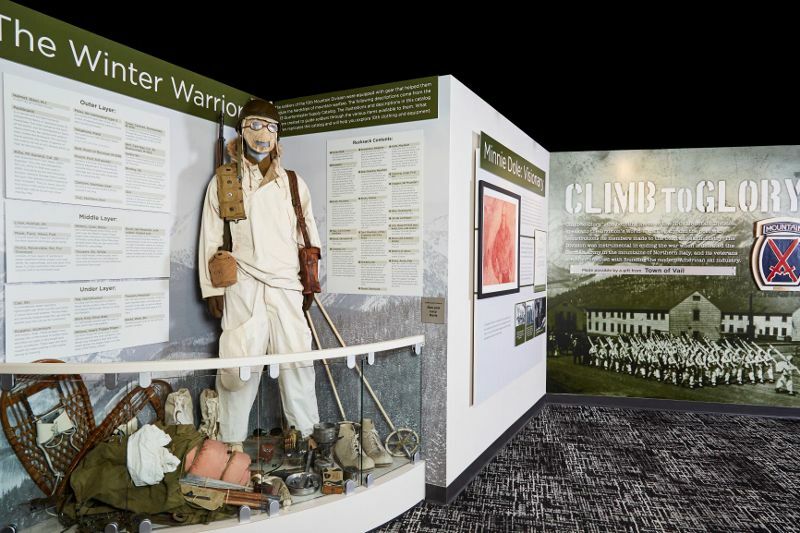 A display in the 2019 Colorado Snowsports Museum and Hall of Fame in Vail honors the 10th Mountain Division soldiers. Two Aspen residents, Gretchen Bleiler and Jeffrey Gorsuch, are part of the Colorado Snowsports Museum and Hall of Fame’s 2019 class. Aspen is well-represented in the 2019 Colorado Snowsports Museum and Hall of Fame class, selected by industry peers. Class members will be formally enshrined Oct. 26 during a ceremony in Vail. On April 12 it was announced that two Aspen residents, 2006 Olympic silver medalist in snowboarding, Gretchen Bleiler, and ski retailer and philanthropist Jeff Gorsuch, were part of the five-member 2019 Hall of Fame class. The ceremony takes place at the Vail Marriott Mountain Resort Lionshead. Reserved tickets are $325 and there is a $250 general individual ticket option as well. Tables of 10 may be purchased starting at $3,750. Go tosnowsportsmuseum.org or call 970-476-1876 for information. All proceeds benefit the Colorado Snowsports Museum. The Hall of Fame voting panel is 140 members strong and comprised of current HOF members, industry representatives and the HOF’s board of directors and nomination committee. This year’s inductees were selected from a field of nominees, which also included Johnny Buxman of Glenwood Springs. Gretchen Bleiler said that while her proudest achievement was the silver medal in snowboard halfpipe at the 2006 Winter Olympics in Torino, Italy, medaling opened the door for accomplishments which have been both notable and sustainable. “Getting to the Olympics and winning a silver medal was a dream come true,” Bleiler said on Sunday, about how she was able to use her notoriety to champion other causes. “I have been able to use my voice to talk about climate change,” she said of efforts that started a decade ago. Those included pioneering the reduction of plastic bottles through the 21-day Reusable Challenge, which led to the development of the stainless steel and BPA-free Alex Bottle. “We started Alex with the idea of living a sustainable life, which is important for every person,” Bleiler said. “Jeff moved to Aspen after college and has run the family’s Aspen retail operation for the past 25 years,” the statement continued. It could be argued that no effort has as large an impact as Gorsuch underwriting the use of up to 300 pairs of skis, boots and poles annually to children taking part in Aspen Valley Ski & Snowboard Club’s Aspen Supports Kids program. Gorsuch has served as the president of the Aspen Valley Ski and Snowboard Club and on the boards of the Aspen Education Foundation and Aspen Community School. Martin Hart. Hart helped develop Steamboat’s air service link through what was termed $30 million worth of “game changing” improvements to the Hayden airport (west of Steamboat Springs) in the mid-1980s. “Martin worked hard to have Steamboat hold onto its old west charm. Martin T. Hart believed in the importance of building a ski area that was good business for everyone — investors, townspeople, skiers, and Colorado as a whole.” Hart passed away in 2014, according to the press release. Jake Hoeschler: Hoeschler used his insurance and legal background to make changes to the ski industry’s indemnification program. “While racing on the World Cup and pro race circuits throughout the 1960’s and 1970’s, Jake noticed how ski shops were struggling to stay in business because of their liability exposure to the threat of frivolous lawsuits. In 1988, Hoeschler founded the National Ski Insurance Program to make skiing a safer sport while also protecting the retailer from an onslaught of unsubstantiated insurance claims,” the statement noted. Hoeschler used his insurance and law background to bring together the “Most every shop in the U.S. is part of this program. Steve Raymond co-founded the Colorado Adaptive Spirit organization in 1995 and has served as its volunteer chairman for 25 years. He was also part of the group of Denver cable television leaders who created SkiTAM in 1995, according to the Hall of Fame. Adaptive Spirit accounts for 45 percent of the USOC Adaptive Ski Team operating budget. “With Adaptive Spirit financial support, the USOC Paralympic team has excelled in international competition. Under his leadership, Adaptive Spirit has raised $20 million which has had a significant impact on the success of the United States Olympic Committee’s Paralympic program. Steve’s efforts have played an important role in the success of Colorado adaptive athletes. Their success, in turn, gives Colorado a world class reputation as the North American epicenter for adaptive skiers to live, train, compete, and win,” the statement continued.